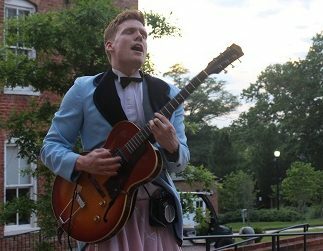 Their name may be Scrappy, but Spartanburg’s only professional Shakespeare company’s production of “Twelfth Night” at Converse College is anything but scrappy. With focus on solid, concise and high-caliber acting, wistful and creative direction and an overall flawless delivery, Scrappy Shakespeare proves the third time is a charm. Launched just two summers ago, Scrappy Shakespeare debuted in Spartanburg with the Bard’s most beloved comedy “A Midsummer Night’s Dream” at The George campus beside Chapman Cultural Center. 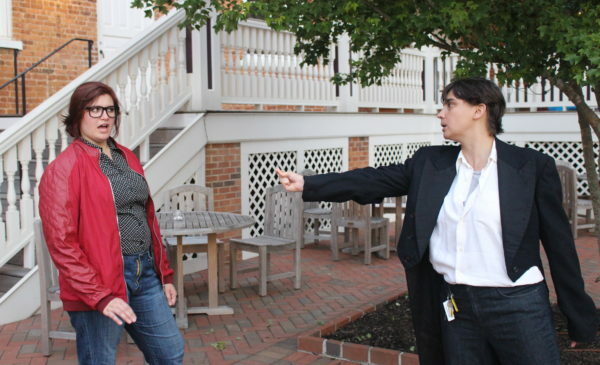 And last year the troupe mounted its first tragedy “Macbeth” at Denny’s Plaza. 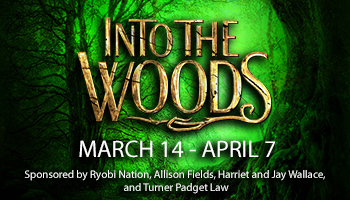 To refresh your memory, fraternal twins Viola (played by Scrappy founding member Sarah Hurley, who handily and with earnest presents two distinct portrayals) and Sebastian (Converse student Maddie Tisdel) are separated during a tempest. In typical Bard gender-bending manner, Viola disguises herself as a man (Cesario) and negotiates Duke Orsino’s (Gem Taylor) marriage proposal to the widow Olivia (a solid, saucily flirtatious Hannah Burgess who recently hailed as Jesus in the Converse tent revival of “Godspell”) and inadvertently finds herself in a precarious and hilarious romantic triangle: Viola loves Duke Orsino, Duke Orsino loves Olivia, and Olivia loves Viola disguised as Cesario. In the second storyline, a polished Tisdel, back as slightly devious gentlewomen Maria, plots with her drunken uncle Sir Toby Belch (a fabulously-gruff and dedicated Connor Vetter, now in her second Scrappy season, who gets in a good belch here) and frequent drinking and mischief partner Sir Andrew (a boisterous and steady turn by Converse senior Gem Taylor, who just got cast in Spartanburg Little Theatre’s fall opener “Legally Blonde: The Musical”), to humiliate Olivia’s imperious steward, Malvolio, played by the one and only Anna Abhau Elliott, esteemed playwright and founding member of both Scrappy Shakespeare and Sparkle City Improv. Their drunken scenes are priceless, but BRAVA to the virtuoso Elliot who handily steals her scenes, whether she is in jail (wait until you see this clever staging) or prancing and self-rhapsodizing like a peacock (oh more accurately, Big Bird) when her Malvolio dresses up in Tweety Bird-yellow tux ruffles, feather hat and stockings for his perceived love encounter with Oliva. This scene is probably the best three minutes in the play. The seven actors (in dual roles) in this mostly female cast meander skillfully through the swath of tables interacting with the audience, even ad-libbing with aplomb if the mood strikes. With a simple hat or adorning of sunglasses, the performers switch parts, but those familiar with the story should be able to follow as each character is identified by name. However, in the limited light of sundown it is more challenging to discern some of the female actors since a most of them have brown hair and a couple have similar facial profiles. But Hurley and Tisdel have identical waves and color, which proves most compelling at the play’s conclusion and the audience can at last believe that a brother may not recognize his own twin sister in king drag and identical red leatherish-hybrid jacket. From the gate, director Tim Giles, co-founder of the company, sets off a 1950s aesthetic (though the script is unaltered except for length) with iconic costumes from the era such as poodle skirts and jeans with T-shirts will rolled sleeves and slicked-back hair like Elvis Presley. And of course, music. Lots of lovely (and often comical) live music. Opening with “You Belong to Me,” the 1952 pop ballad made famous by Jo Stafford, the music includes dashes of interludal modern covers like Amy Winehouse, but the thrust of score (doo-wop and rock-and-roll styles of the 1950s and early 1960s) is original and composed by Giles, who set to music the bounty of song lyrics the Bard penned for the play. In this crafty and robust characterization, Mann croons (and collects a lot of money from the other characters in doing so) in most every song and gently plays his electric guitar throughout the show using a cool micro-amp on his belt.” To watch the always-impressive Mann in a poodle skirt and blue-tuxedo jacket effortlessly strumming chords and singing Shakespearean sonnets, while nearly always sauntering through the audience and staging area, is a sight to behold and cherish. But the entire cast gets into the musical wonderment of “Twelfth Night,” providing classic doo-wop harmonies and underscoring and some occasional snapping, all choreographed and stylized by Anna Elyse Lewis, 2016 Scrappy actor and leading lady of SLT’s “Xanadu” opening July 14. Grauler Haus, dedicated local arts supporter and host of HUB-BUB’s popular Drive-By Shakespeare series, will also be on hand at every performance selling beer. And it is okay for patrons to refill their Grauler stein during the show, though you may want to hit the restroom before as “Twelfth Night” is about 90 minutes with no intermission. 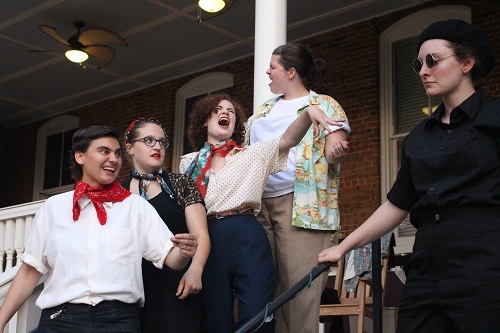 “Twelfth Night” opens tonight Thursday, June 15 at 7:30 p.m. and runs Thursdays-Sundays through June 25 at Converse College in the courtyard behind Wilson Hall. FREE. For more information, visit http://scrappyshakes.weebly.com/. Elliot to Elliott & crew : Whew! Am exhilarated & exhausted even at this distance. Bravos and Ahs!! !